A No-Bake Chocolate Traybake made of all things Delicious. 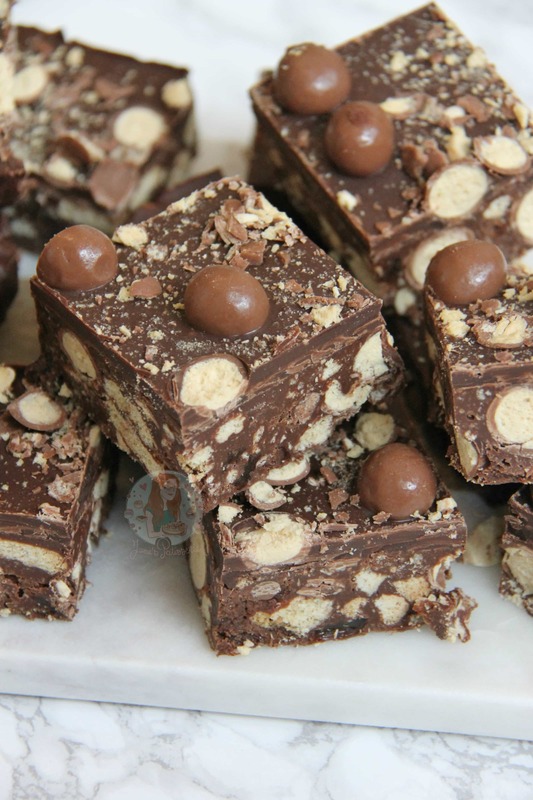 Biscuits, Maltesers, Dark and Milk Chocolate and more making heavenly Malteser Tiffin! 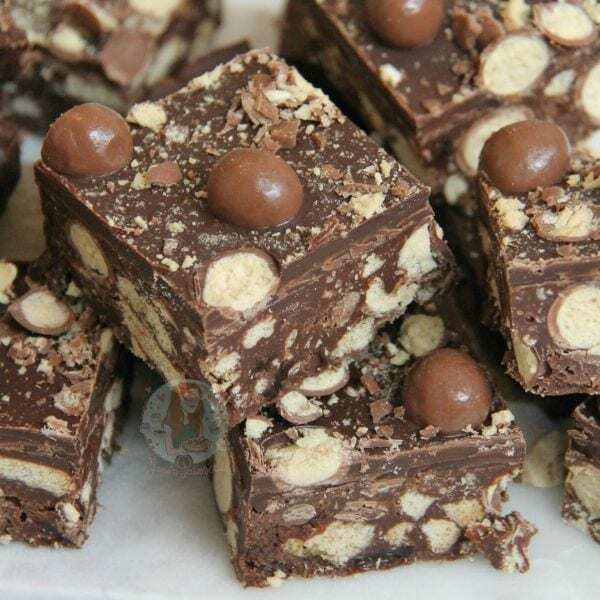 So Tiffin is a delicious treat, that I have always adored. 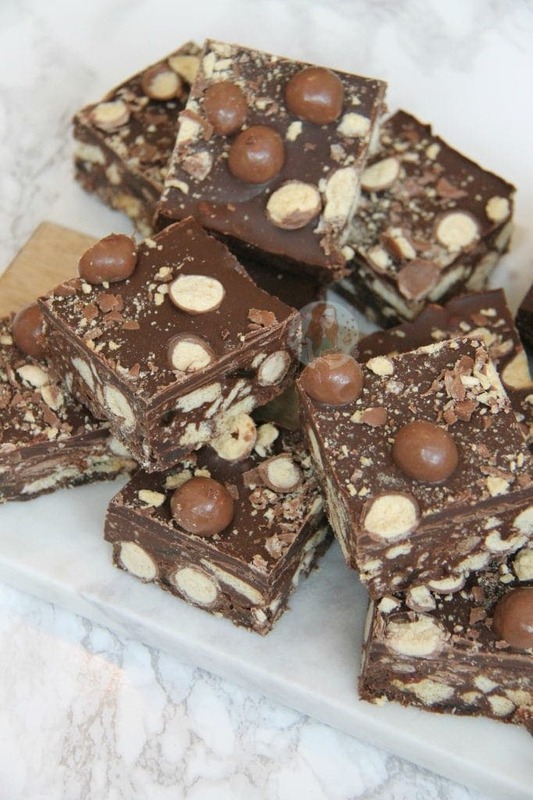 I will admit that it has often taken second place to Rocky Road because I naturally preferred it… but this recipe changes things. I’ve never thought of this recipe as being one to virtually disappear as soon as it was given out for eating, but it did. Like, it VANISHED. 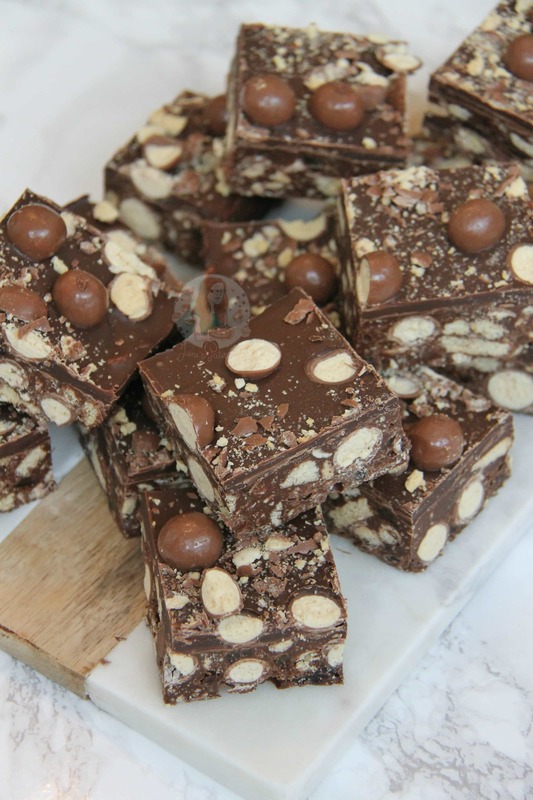 I decided that with this recipe I would rather mix Dark Chocolate and Milk Chocolate together as I have always preferred my tiffin with a slightly darker taste compared to my Rocky Road in which I use Milk Chocolate alone. For this particular recipe, I thought going half and half with the two chocolates was ideal, but in reality you can use any combination you like. 100g of Dark, and 300g of milk, all dark, all milk, half and half etc. You can of course make this recipe without the Maltesers if you are not a fan… but I had three bags in my cupboard that I wanted to use up. You can increase the digestives in the recipe, or even add another element that you preferred. Same goes for the raisins, I get that a lot of people don’t like raisins… but I do love a good tiffin with raisins in it. They make it seem healthier almost?! 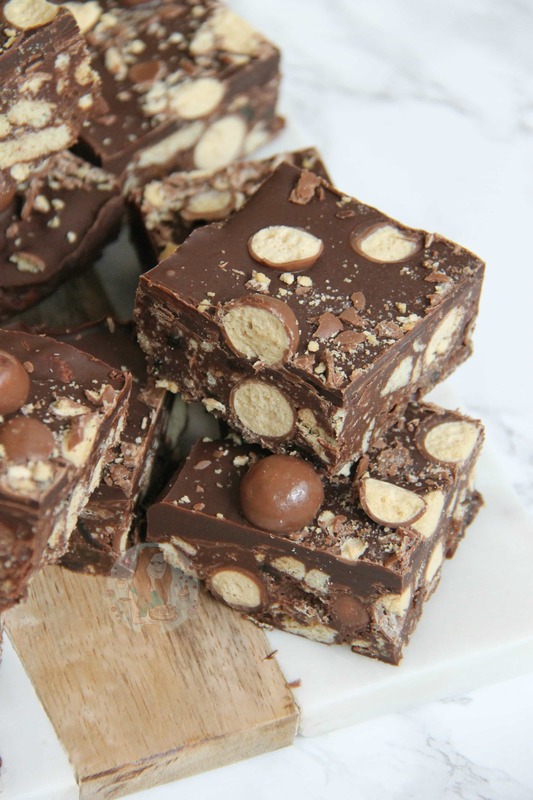 This recipe is reasonably similar to my Cornflake & Malteser Rocky Road but I will still go ahead and call it Tiffin. 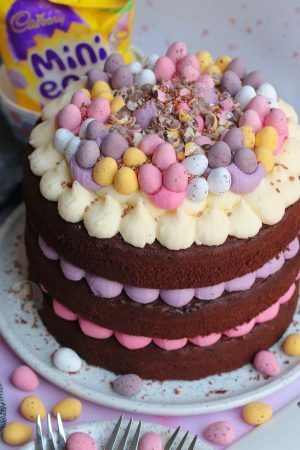 I like the extra chocolate layer on top as it makes it look nicer, and its an extra chocolate hint so whats not to love?! Again, this is optional (as I am well ware the pure amount of chocolate that has been used in the same recipe) but YUMMY. The method of heating the Golden Syrup and Butter together helps prevent splitting which can happen to some people when combining the two ingredients with Chocolate. Often, splitting is down to the temperature becoming too high, so adding the chocolate to the heated Syrup/Butter mixture is an easier method! Line a 9×9″ square baking tray with parchment paper, leave to the side. Melt the golden syrup and butter gently in a pan on a low heat – when the butter and syrup have melted fully and started to bubble slightly, turn the heat off and add the chopped chocolate and stir until the chocolate has melted. If it doesn’t quite melt then turn the heat back on to a very low setting so that the chocolate doesn’t split. Pour the digestives, maltesers, and raisins into a large bowl and pour the chocolate/syrup mix on top. Mix the ingredients together thoroughly until its all coated well. Pour into the tin and press down very firmly. 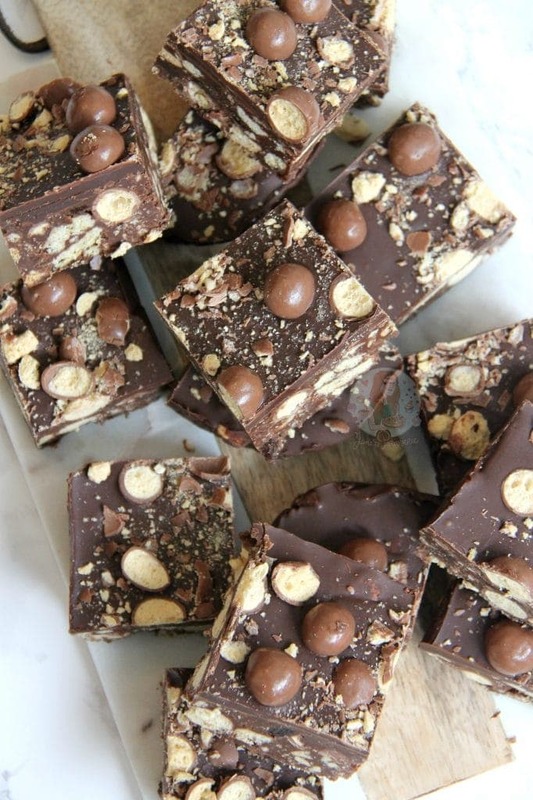 In another bowl, melt together the next set of chocolate and pour on top of the Tiffin. Sprinkle on a bag of maltesers, and crush a few over as well. Leave to set in the fridge for 3-4 hours, or a bit longer if it still feels too soft. Once set, carefully remove from the tin and cut into your pieces. I do 4×4 so I get 16 large pieces, or 5×5 for slightly smaller but still delicious sized pieces. I use any chocolate for my recipes that I can – some more expensive than others, it doesn’t really matter. If you are after a good quality chocolate then Callebaut is the way to go, but I even love Tesco’s Every Day Value chocolate which is only 45p for 100g! This recipe will work perfectly with Milk and Dark Chocolate, but not so much with White Chocolate. You can use all Milk Chocolate if you like, or all dark, but the sweetness level will change. 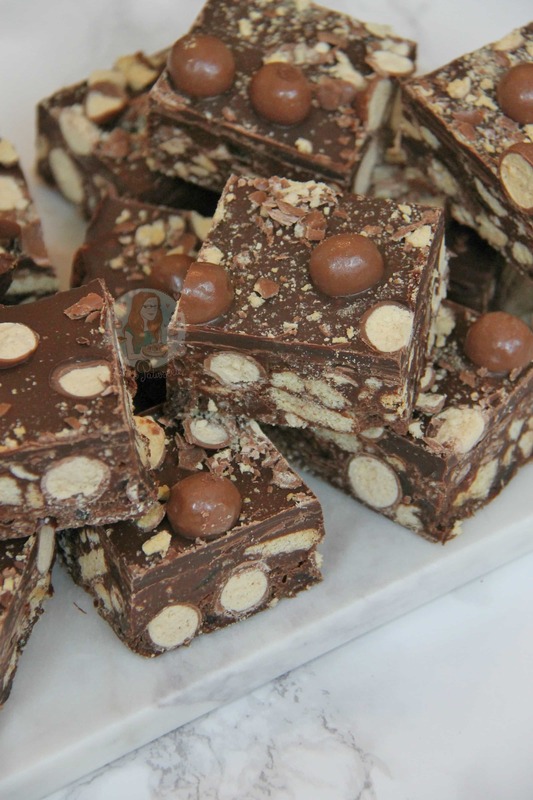 I like the mixture of both so its less sweet than Rocky Road, and more Tiffin like. Older Next post: No-Bake Snickers Cheesecake! Newer Previous post: Mini Victoria Sponge Cakes! This looks fantastic! And something I want to make soon. You mentioned that it can kerp for 1-2 weeks in the fridge but can it also be kept at room temperature (after it has turned solid in the fridge) for a couple of days with no ill effects? So if i make this on a Tuesday morning, refrigerate until Wednesday morning then cut and put in a airtight container, will it be fine? Until Thursday/Friday? 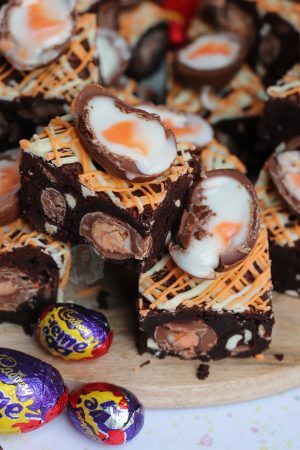 Also, have you ever tried this recipe with mini eggs? 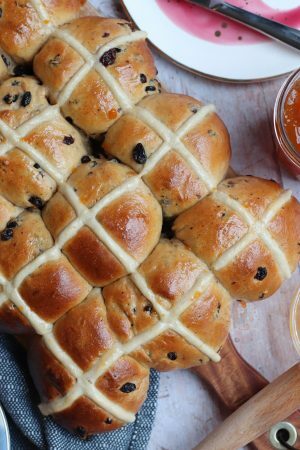 I was thinking of doing it for easter but going back to the malteser version at other times of the year. Hiya! Yes that would be fine – its just best to set it in the fridge so its properly firm. And then yes I have also tried it with mini eggs and its delicious. Could I use medjool dates instead of raisins? I like to add dried cranberries at this time of year to make it “seasonal “ . Also, nuts are good too! It is a biscuit – a plain biscuit, sometimes used also for the base of desserts but great with just a cup of tea. I think the US equivalent is a Graham Cracker…? It will work with sugar cane syrup? I have no idea, I have never used that before. Holy crapola I can’t wait to make these!! 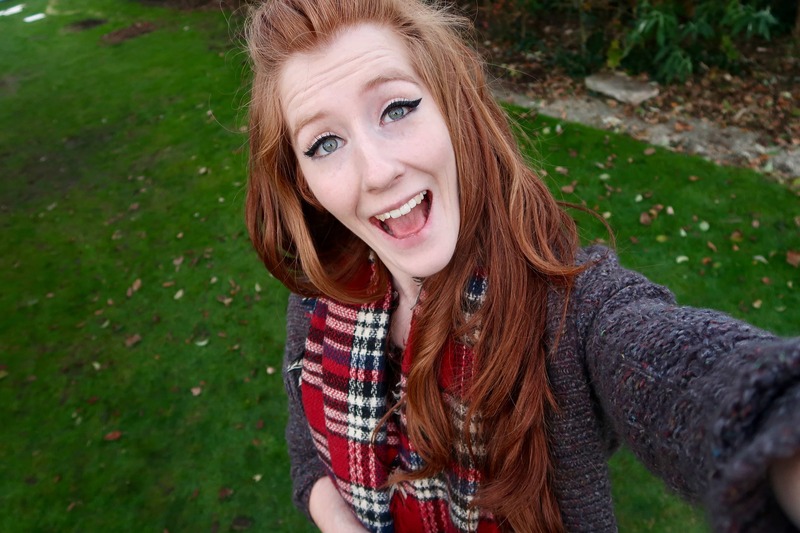 Malteasers are my absolute fave ? 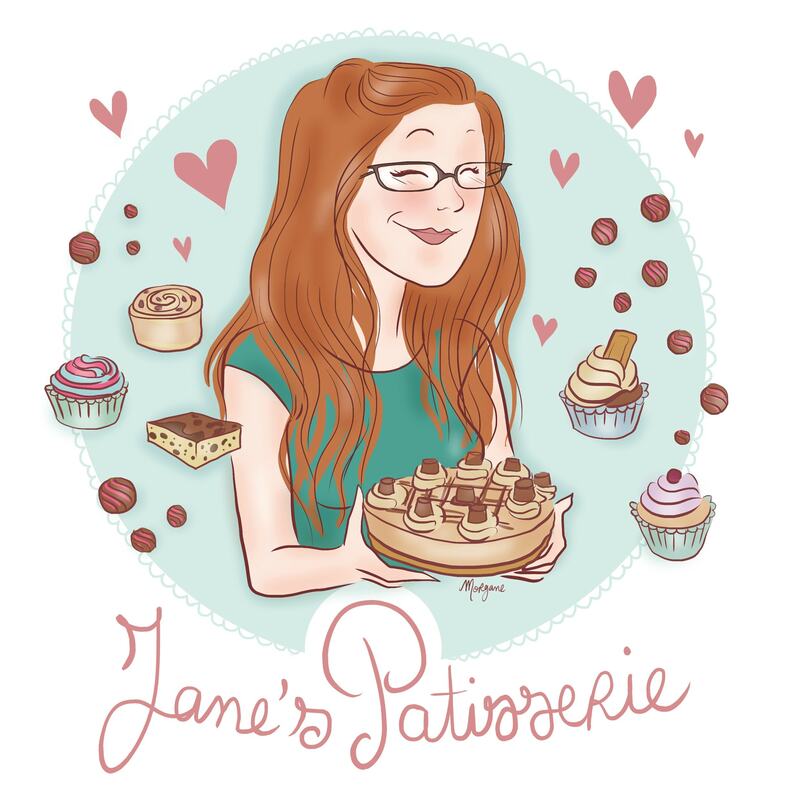 I am making your malteaser cheesecake for my birthday in a couple of weeks, I don’t plan on sharing it….! Muahahaha! !